Children with autism are known to be sensitive to a variety of sensory stimuli; and because of this, most of them cannot enjoy some leisure and relaxation activities typical individuals do. One good example is movie-watching, most children with autism cannot get inside a movie house; and therefore cannot join their families and enjoy a good movie together. The darkness of the room, the loud sound, the required quietness while watching and the prolonged sitting can contribute to sensory overload, which may lead to tantrums. 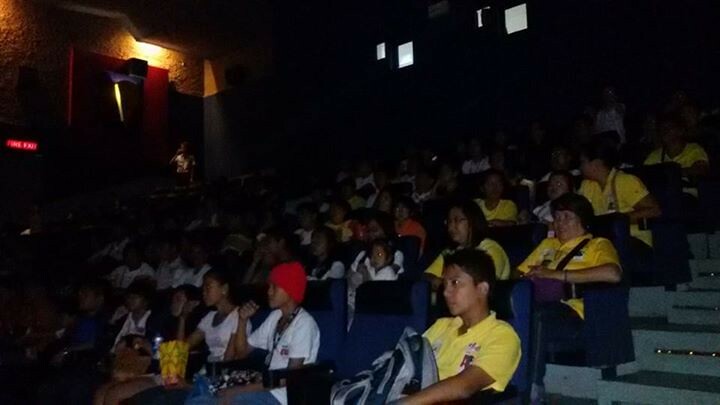 SM Cares through SM City Pampanga hosted a SFM event entitled “Lights up Sound down” exclusively for children with autism and other disability last 30 July 2014, Wednesday, 10 in the morning at SM City Pampanga Cinema 3. The activity aims to provide children with autism a movie watching experience on a big screen inside a cinema that have been adapted to their sensory sensitivities together with other audience who can understand the shouting/crying and/or running of these children inside the room. The event was attended by a total of 108 children with special needs along with their parents and caregivers from the members of ASP CSFP and Hagonoy Chapters, DepEd ALS-PWD learners from the Division of San Fernando and San Simon, Adelle Grace Montessori, Crownvale School and San Fernando Elementary School students with autism, along with other CWA from other towns of Pampanga. Many children with autism who came are “first timers” and their parents were quite nervous about how their children will react. But it was such a great feeling to see these children and their families enjoy a movie together. “Thank you for yesterday’s activity. You made the children so happy. They really enjoyed. Congratulations!”- Melissa Sanchez, DepEd ALS Coordinator, Division of San Fernando. “Thank you, it was so much fun! Di ko expect kaya pala naming tapusin yung movie” – Mommy Malou Maniago, mother of Ericka, 5 yrs old with autism. “Success! We were all happy, akala naming “wonderland” lang kami mga mommies kasi di naming expect na magtatagal sila sa loob. Expect the worst, hope for the best! Yahoo! Another milestone for the kids.”- Mommy Eugie Corpuz, mother of Bianca, 7yrs old with autism. “It was a very fun experience for a big number of special ones as it allowed them to watch a full length movie wherein they can be themselves without excuse. They can stim out loud minus the comments. And they can easily walk away at scenes they don’t want to see without the odd reactions from the other viewers. But above it all, such a relief for all parents, guardians, family members, teachers who accompanied each kid as they also enjoyed the movie with emotional easiness.” -Mommy Wham Liang, mother of Josh, 5 yrs old with autism. The Autism Society Philippines City of San Fernando Pampanga Chapter, with all the children with special needs and their families extend our warmest gratitude to SM Cares, through SM City Pampanga Management headed by Mr. Junias Eusebio and Anna Lisa Carino. About the contributor. Joy Ofrecia is a mother of a teenage boy with autism. She has been a hands-on mother and for more than 10 years, has been implementing home intervention programs along with other school/center-based interventions for her own son and other children with autism. She has earned her Master’s Degree in Special Education from Angeles University Foundation. She conducts orientations and trainings to parents and professionals on autism. She is the current president of the Autism Society Philippines City of San Fernando Chapter. Teacher Joy finds her fulfilment in her role as an advocate of autism and an instrument to empowering parents of children with special needs.